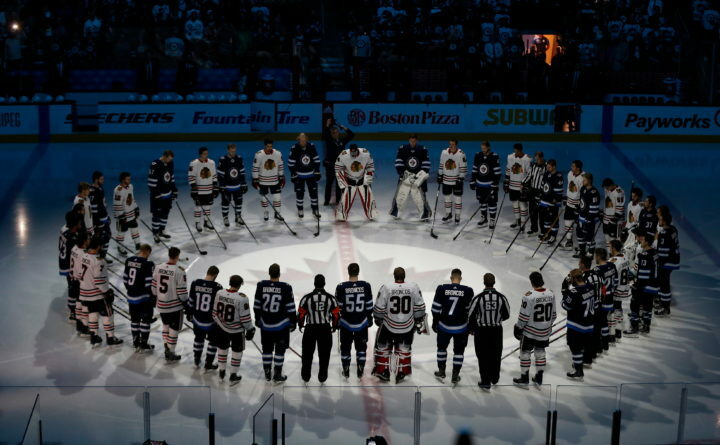 The Winnipeg Jets and the Chicago Blackhawks come together at center ice wearing Broncos on the back of their jerseys for a moment of silence for the Humboldt Broncos bus crash victims before NHL hockey game action in Winnipeg, Manitoba, April 7, 2018. HUMBOLDT, Saskatchewan — A hockey arena became the epicenter of grief for a small Canadian town on Sunday, as friends, relatives and those that housed the young hockey players gathered to mourn 15 people killed after a semi-trailer slammed into a bus carrying a youth hockey team in western Canada. The Broncos are a close-knit team who dyed their hair blonde for the playoffs. The bus was driving the team to a crucial playoff game Friday against the Nipawin Hawks. A vigil will be held on the hockey team’s home ice Sunday night, and a makeshift stage and hundreds of chairs sit ready for the memorial. The tractor-trailer would have had to yield to a stop sign before crossing over the highway that the hockey bus was traveling on. There is a stand of trees on the southeast corner of the intersection, limiting visibility of the approach on both roads.